Few places welcome visitors with a "bloody" hand, but the Myddelton family coat-of-arms above the elaborate gates does indeed incorporate just such a symbol. One legend tells of two contenders to the inheritance of the 700-year old castle who had a race to the gates. The leader reached out to touch the gates and claim the prize, only for a supporter of his adversary to cut off his outreached hand with a sword, hence the gruesome symbol. home a somewhat forbidding look from the outside. The interior is equally paradoxical. The medieval Adam Tower and the stark dungeon hollowed out of the rock deep underground show one side of the castle's history, while the elegant 18th century staircase and the fashionable suite of state apartments speak of a totally different way of life. 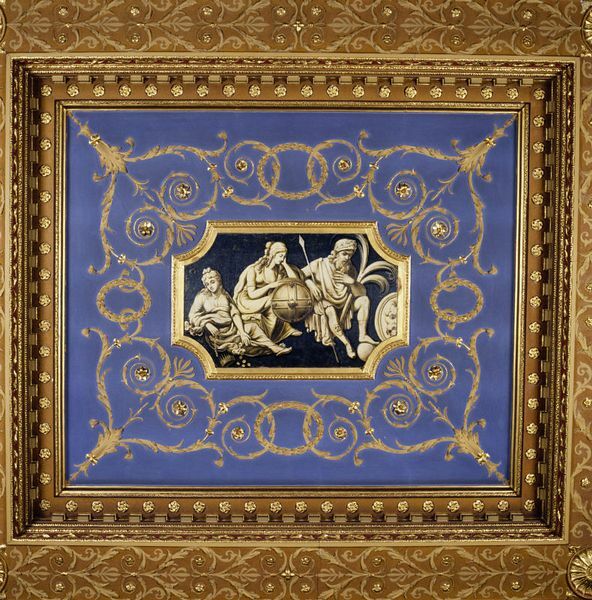 The sumptuous saloon has a wonderful blue coffered ceiling inset with Greek mythological scenes by Irish painter, George Mullins. Beautifully gilded doors and a red and white marble fireplace complete this unique room. 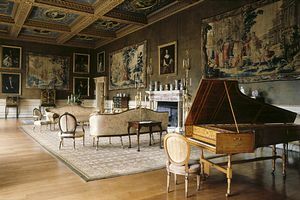 The walls of Chirk Castle are hung with Mortlake tapestries, family portraits and works of art by Peter Tillemanns among other noted artists. 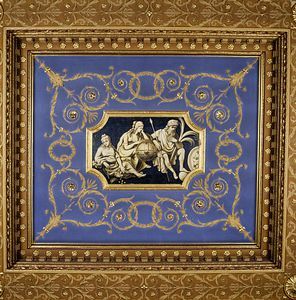 The hundred-foot long gallery is also impressive and the panelled walls are decorated with endless agapanthus leaves above the portraits. In contrast, the family rooms have been designed for younger visitors who are invited to try on costumes and play games. bought by Sir Thomas Myddelton in 1595 and the family continue to live in part of the castle. 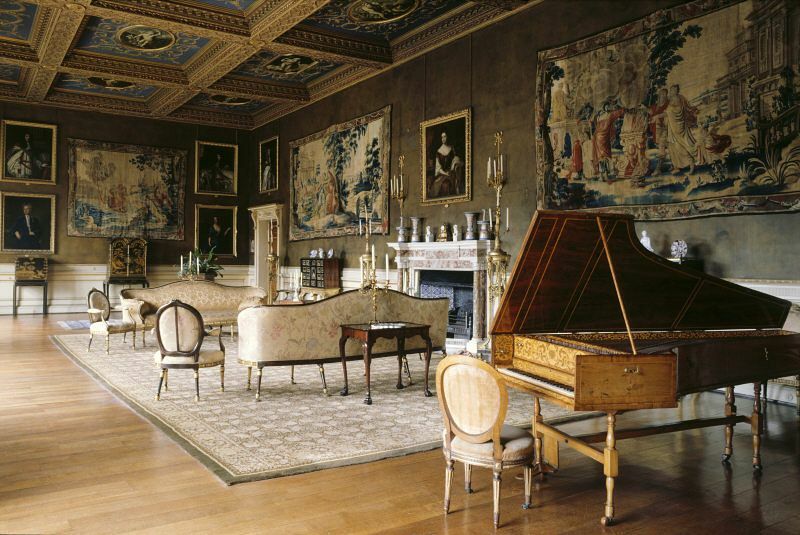 Chirk Castle actually means "Meadow Castle" and when you see the beautiful setting, you can understand why. The extensive woodland and farmland stretch to the Welsh borders and Offa's Dyke. The landscaping around the castle was done in the late 18th century by William Emes who softened the grim walls with climbing roses and scented honeysuckle. There is a sunken rose garden with a delightful 17th century sundial. From the snowdrops in spring to the vibrantly planted mixed summer borders and topiary-clipped yews this is a garden for all seasons. The thatched hawk house is covered with a tangle of vines and can be seen from the 17th century avenue of lime trees. The classical pavilion at the end of the long terrace is the perfect place to sit and appreciate the fine views on a summer's day. Further buildings to enjoy include the Old English style Lodge and the nearby Parish Church of St Mary which has more family history. Finish the day at the tea rooms with homemade cakes or pick up local produce from the farm shop. Gifts, plants and second-hand books are also available in the National Trust shop on site.